A massive 84.6 per cent polling was witnessed in Jammu division. JAMMU: The sixth phase of panchayat polls concluded peacefully across Jammu and Kashmir on Saturday with an estimated 76.9 per cent electorate-- highest so far-- exercising their franchise amid tight security arrangements, state's chief electoral officer Shaleen Kabra said. A massive 84.6 per cent polling was witnessed in Jammu division, while only 17.3 per cent polling-- which incidentally was the lowest compared to the previous five phases-- was recorded in Kashmir division, Kabra said. Giving district-wise details, Kabra said, Ganderbal district in central Kashmir recorded the highest voting (41.5 per cent) followed by Bandipora (35.3 per cent), Srinagar (12.5 per cent), Baramulla (12.1 per cent), Budgam (9 per cent), Anantnag (7.3 per cent) and Kulgam (4.6 per cent). Like previous phases, Jammu division, however, recorded heavy turnout with Udhampur district topping the chart with 88.5 per cent of the people casting their votes. Jammu district recorded 87.1 per cent voting followed by Reasi (85.6 per cent), Samba (84.7 per cent), Kathua (84 per cent), Rajouri (83.6 per cent), Poonch (81.8 per cent), Ramban (81.5 per cent) and Doda (80.4 per cent), Kabra said. In the fourth phase, the state witnessed 71.3 per cent voting with 82.4 per cent electors exercising their franchise in Jammu division and 32.3 per cent in Kashmir division. In the fifth phase, an overall poll percentage of 71.1 per cent was witnessed across the state with 85.2 per cent polling in Jammu and 33.7 per cent in Kashmir. Chief secretary B V R Subrahmanyam was camping in Srinagar to monitor the election process in the Valley. On behalf of Governor Satya Pal Malik, he complimented the civil and police administration for ensuring another phase of free, fair and peaceful polls to strengthen the democracy at the grassroots level, an official spokesman said. 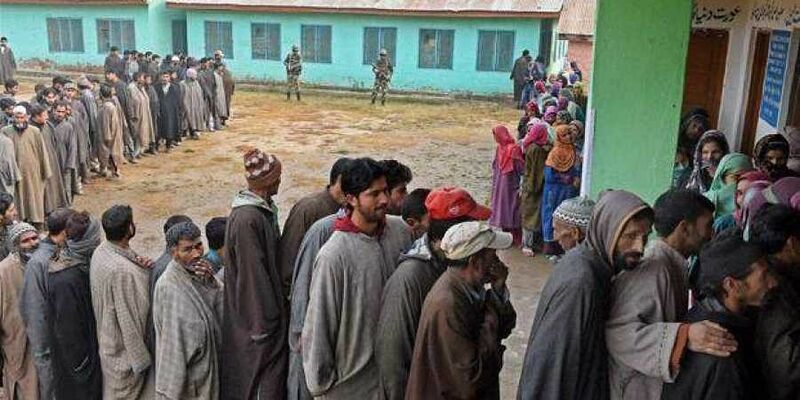 The polling for the sixth phase of the nine-phased panchayat elections began at 3,174 polling stations - 410 in the Kashmir division and 2,764 in the Jammu division at 8 am and concluded at 2 pm, the spokesman said. A total of 771 polling stations-- 410 in the Kashmir division and 361 in the Jammu division were categorised as hypersensitive. As many as 7,156 candidates were in the fray for 406 sarpanch and 2,277 panch seats in the sixth phase, while 111 sarpanches and 1,048 panches were elected unopposed, the spokesman said. A total of 5,97,396 voters were eligible to exercise their franchise for the sarpanch constituencies and 4,57,581 for the panch constituencies.